You have probably heard of dry brushing or even might have tried it as this practice is becoming quite popular around the world, even though it is a centuries old trick around many cultures. It is mostly offered in Spa's for body detoxing but you can do it at home with some right knowledge. All you need is a brush with wooden handle and natural bristles. It might look harsh and even feel in first few attempt but your body will get accustomed to it after regular use and become less sensitive. However if you have very sensitive skin and get rashes or burns easily, use very light hand but if it still doesn't work for you, it is better to avoid it. Usually before shower, a practice of brushing your skin with dry brush is called dry skin brushing. In this practice brushing is done in the direction of heart from all sides, including feet, hands or shoulders. The brush must have natural bristles with long handle which can reach all your body parts easily. The best suggested timing is in the morning before shower. Use light hand where skin is soft and thin while you can use more pressure on tough skin like soles or back area. There are five benefits for which the dry brushing is suggested. Dry brushing help shed dead skin which is noticeable in first use. When you move dry, natural bristles of brush on skin, it effectively remove dead cells and other impurities from the top layer of skin leaving it soft and smooth while dead cells make skin rough and dry. With regular use you will notice that your skin looks healthy and supple. It can even get you rid of pigmentation caused by dry and dead skin on knees, elbows or from your back. If you don't know, lymphatic system transport lymph, a fluid containing infection-fighting white blood cells, throughout the body and help rid the body of toxins, waste and other unwanted materials, hence it is major part of the body’s immune system. 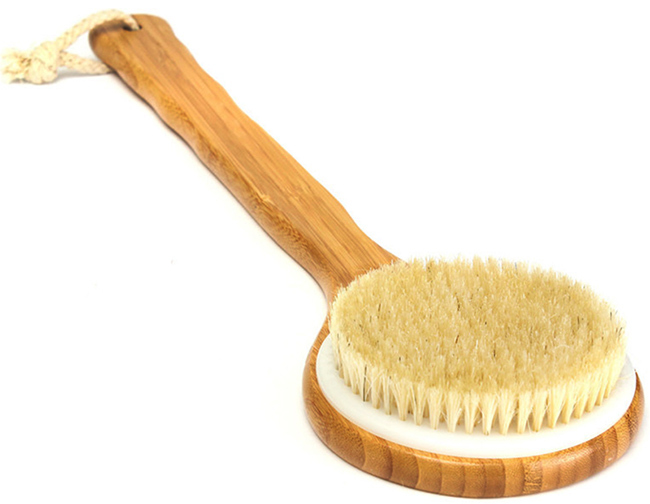 As many of lymph vessels run below the skin, dry brushing help stimulate normal lymph flow which in return naturally detoxify body and boost immune system. The biggest benefit for which people try dry brushing is the claim to reduce cellulite. Though the visible result need regular use and patience. However as this practice improve blood circulation, cell rejuvenating, improve moisture balance of skin, you will eventually see the improvement in your skin. Your skin will become soft and supple with improved skin texture. As using dry brush exfoliate your skin naturally, it also remove other impurities from pores like oil and dirt which can clog them. The clogged pores can led to break outs and specially the reason for back acne. The regular use of dry brushing will help better oxygenation of the skin, leaving it clean and clear while make pores less visible. If you want to dry brush your face, use gentle brush with soft bristles. Dry brushing also energize and stimulates the body for which it is suggested to use in morning before shower. As you run the brush on your skin it help relax the tired muscles and improve blood circulation which can boost your energy. As said earlier it also improve your lymphatic system function which will help with better digestion and immune system which can give your body new start everyday. How to dry brush efficiently? First of all choose the brush with natural bristles. For body get one with stiff bristles and for face get small and softer version. It is better to get one with long handle which can reach your back and other difficult areas. Preferably do the dry brushing in morning but you can do at any time of the day. Use long sweeping strokes and start from the soles of feet, then top, continuing to legs, then from hands to arms continuing towards your heart. Same way brush your back, shoulders and neck in the direction of heart. Use circular clock wise strokes on abdomen. Brush each section for several times and move forward. After brushing take regular shower or bath and moisturize your skin with natural body oil or organic lotion. Clean the brush at least once a week and dry it in open place to avoid mold. It depends on what you are aiming at with this practice. It does exfoliate the skin which is visible in first attempt and you can feel the better, soft and supple skin. It is similar to body massage which can relax your body and improve blood circulation which in turn make you feel energized. Overall it is all about few minutes effort and patience for long lasting results and you can see if it works for your or not. At the end it is also an effective exercise which can never hurt. Do you want to try dry skin brushing? If you already do, what benefits have you noticed?